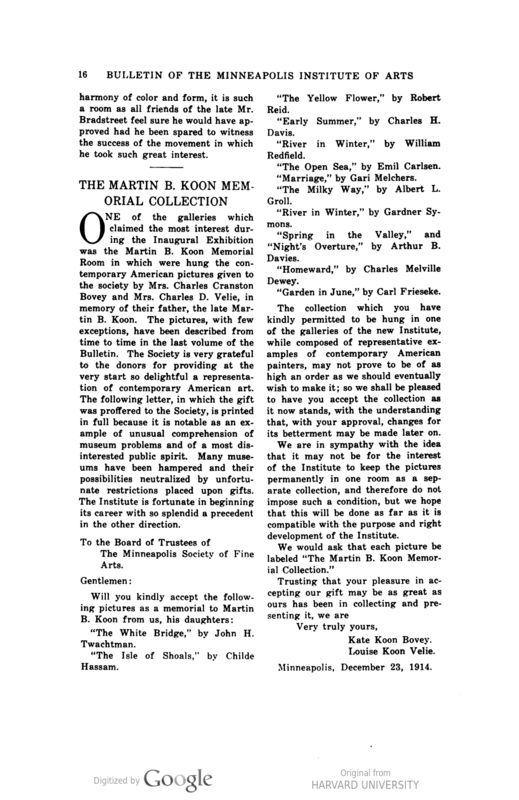 One of the galleries which claimed the most interest during the Inaugural Exhibition was the Martin B. Koon Memorial Room in which were hung the contemporary American pictures given to the society by Mrs. Charles Cranston Bovey and Mrs. Charles D. Velie, in memory of their father, the late Martin B. Koon. The pictures, with few exceptions, have been described from time to time in the last volume of the Bulletin. The Society is very grateful to the donors for providing at the very start so delightful a representation of contemporary American art. The following letter, in which the gift was proffered to the Society, is printed in full because it is notable as an example of unusual comprehension of museum problems and of a most disinterested public spirit. Many museums have been hampered and their possibilities neutralized by unfortunate restrictions placed upon gifts. The Institute is fortunate in beginning its career with so splendid a precedent in the other direction. To the Board of Trustees of The Minneapolis Society of Fine Arts. The White Bridge, by John H. Twachtman. The Isle of Shoals, by Childe Hassam. The Yellow Flower, by Robert Reid. Early Summer, by Charles H. Davis. River in Winter, by William Redfield. The Open Sea, by Emil Carlsen. The Milky Way, by Albert L. Groll. River in Winter, by Gardner Symons. Spring in the Valley, and Night’s Overture, by Arthur B. Davies. Homeward, by Charles Melville Dewey. Garden in June, by Carl Frieseke. The collection which you have kindly permitted to be hung in one of the galleries of the new Institute, while composed of representative examples of contemporary American painters, may not prove to be of as high an order as we should eventually wish to make it; so we shall be pleased to have you accept the collection as it now stands, with the understanding that, with your approval, changes for its betterment may be made later on. We are in sympathy with the idea that it may not be for the interest of the Institute to keep the pictures permanently in one room as a separate collection, and therefore do not impose such a condition, but we hope that this will be done as far as it is compatible with the purpose and right development of the Institute.